Calling everyone on a diet everywhere! Unless you are doing a crazy diet that cuts out a whole food group, this is one healthy recipe you can’t afford to leave out of your repertoire! The Turkey and Sweet Potato Pie. Turkey and sweet Potato Pie is low in fat – thanks to the lean turkey mince! Is jam-packed full of vegetables, making sure you get your five-a-day. And most of all it is full of flavour! It really is proof you never have to go bored or hungry on a diet ever again. The turkey mince I have used is the best of British and can be bought fresh from all good supermarkets, and I’ve also used a slightly more unusual ingredient, Peppadew peppers! Very tasty, sweet little preserved peppers which give you a bit more of a kick than normal fresh red peppers would. Also sweet peppers are coming into season so if you can get your hands on some they’d also go really well in this. 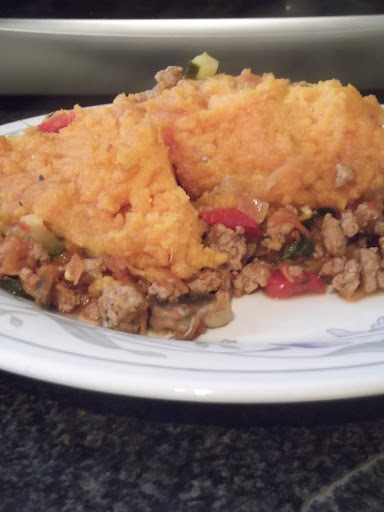 Turkey and sweet Potato Pie is a great twist on the classic Shepherds Pie but still tastes delicious. Try it for dinner tonight! Pre-heat your oven to gas mark 6 and bring a pan of water to the boil. Peel and chop your sweat potato into chunks no thicker than 2 inches. Place these into the boiling water and cook for 10mins or until soft enough to mash. In the meantime, spray a large pan with a little of the low fat cooking spray and brown the turkey mince on a medium heat. When it has cooked through add the vegetables (chopped) and let them cook for five minutes before adding the garlic and Italian seasoning. Cook for five minutes before adding the chopped tomatoes and spinach. Allow this to simmer for 5 to 10 minutes which mashing the sweet potato. Mash the sweet potato in the same way you would normal potatoes though without the addition of butter or milk. Season the mash with salt and pepper. Place the mince into a large casserole dish and top with the mash. Place into the centre of your oven and cook for another 20-25mins or until the top has begun to turn golden and crisp. Thanks Abi! It's a favourite in our house now. It's lighter than Shepherds Pie so it's good when the weather gets a little warmer.